Discussion in 'MacBook Air' started by shiva31, Jun 28, 2013. I'm French I'm gonna move to UK very soon so I plan to buy a new laptop and I'm confused about which keyboard layout I should pick. In any case I want to take a QWERTY one. Since I have to learn a new layout, which one is better ? Is the US enter key better ? Would a French keyboard prevents u from writing in Englsh? Is English going to be ur primary communication language? Go for the UK one. UK has the better sized enter key. The French keyboard doesn't prevent me to write in English but since it's only used in France and since I will spend few years of my life there I want to take the plunge. The QWERTY one must be more useful for writing in english (at least I hope ) plus If one day I have to use a computer which is not mine there then I won't be disturbed. Yes, it will become my primary communication language. I haven't seen much difference between both, except about the enter key. Yeah I find AZERTY a pain to write in English with. Go for the UK one as I said. Double height enter key I prefer quite a bit to the half height US one. I was writing when you replied so I didn't seen your first post. Thank you for your opinion, I also think that the UK enter key must be better (although it looks very tiny on the Macbook Air compared to a desktop keyboard) but I've never tried the US one so I can't be sure. I'd rather wait for more opinion about that. Also if someone could enlighten me how the US keyboard differs from the UK one (resulting in a bigger return key) could you? Go for the UK one. It's a great layout, having a big Enter key is really nice. and you have the £ and , which as a Frenchman living in Britain, you will definitely use. The Macbook Air has a wonderful keyboard, it's in no way undersized compared to a desktop one. For keys like tab, caps lock, shift, control, command, etc., the UK keyboard uses "symbols" whereas the US keyboard uses "words". Also, the left shift key on the UK keyboard is shrunk in width. IMHO, the enter key being taller but narrower doesn't necessarily make it easier to hit. Thanks to everyone. Since everyone seem to go for the uk keyboard then I'm gonna pick that one. I didn't know that US keyboard doesn't have £ and € . The ideal layout is the US one. It's easier to touch type even with small hands (one row long enter, long shift keys, long backspace). Don't forget to get a proper external keyboard to use when you're not on the go. Although the macbook keyboard is better then most notebook keyboards out there, it still can't compare to a good external one. Thanks for this picture/article. I think maybe I'm just used to typing on a UK keyboard now, I think the US one is weird . I know a lot of the time I end up hitting the top half 'wider' part of the return key. Here in Hong Kong we have the US one too. Even though I live in the UK and use the UK layout, I couldn't use the US just because theres no arrows keys? why they non existent on USA layout? Noticed from the 2 pictures comparing both above aswell, the UK layout tends to use a lot of icons for backspace/shift etc.. as the US one just uses the word. Such a big difference if you think for the same language haha! I think the US keyboard shown in the pic is not a MacBook one, more like a full keyboard with Numpad, so the arrow keys are just on the right (not shown in the pic). As for the symbols/icons Vs words, my wild guess would be something to do with the various languages in Europe? i.e., All European keyboards use symbols. But yet in Asia, we always have our "word keys". I really think Apple should put the symbols alongside the words on the keys, making the short-cuts in pull down menus easier to understand. 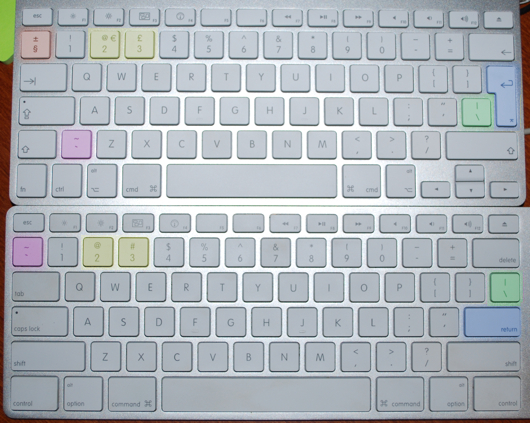 Long shift keys and backspace from the image linked come from the arrow keys not being there and having more space, as the US one shown is the wired keyboard and the UK one wireless. Backspace/delete keys are similar but UK one does have a shorter LEFT shift, because of an extra key on that row.